Gervinho, left, disappointed for Arsenal but he has flourished at Roma and led the Ivory Coast to a win against Senegal. (CNN) -- Gervinho's unsuccessful spell at Arsenal came to an end last summer when he was sold to Roma. The winger is now flourishing in Serie A and carried over his form to the international stage Saturday as he led the Ivory Coast to a 3-1 win over Senegal in the first leg of their playoff tie. 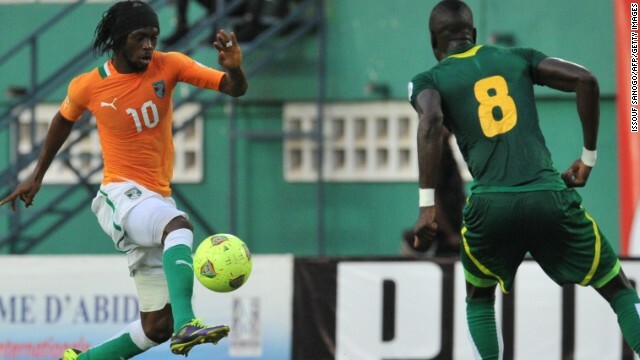 He played a role in all three goals in Abidjan, earning a penalty that Didier Drogba converted in the fifth minute. His good ball led to an own goal in the 14th minute and he assisted on Salomon Kalou's effort that made it 3-0 in the 50th. But Papiss Cisse's goal deep into injury time left Senegal with slight hope of appearing at the World Cup for the first time since bursting onto the scene in 2002. Senegal, however, won't have full home-field advantage in the return leg, playing next month's match in Morocco because of a stadium ban in Dakar. The ban was imposed after an African Cup of Nations qualifier between Senegal and the Ivory Coast last year was cut short due to crowd trouble. The winner of the tie earns a place at next year's World Cup in Brazil and the Ivory Coast -- which lined up in Germany in 2006 and South Africa in 2010 -- will be expected to complete the job. There was controversy in the other African playoff contested Saturday. Burkina Faso, which has never featured at the World Cup, converted a late penalty to edge visitor Algeria 3-2. To the disbelief of the Algerians, Zambian referee Janny Sikazwe awarded the spot kick for Essaid Belkalem's handball, which didn't appear to be deliberate. Algerian players protested but the call stood and Aristide Bancé -- who missed a penalty in the first half -- broke the deadlock in the 86th minute. Algeria had twice come back in Ouagadougou. On Sunday, Ethiopia hosts Nigeria and Tunisia entertains Cameroon. Egypt visits Ghana on Tuesday.